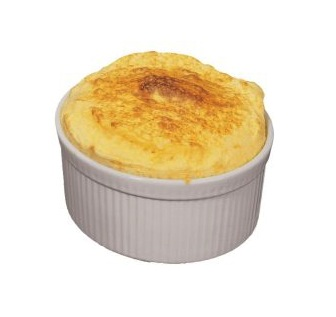 Souffle Dish - 16 oz. Home > Kitchenware > Bakeware > Souffle Dish - 16 oz. This souffle dish is the perfect size for savory or sweet soufflï¿½s and custards, or for serving rice, veggies or fruit salads. High sides allow egg-intensive dishes to rise the desired height without seeping over the sides of the dish. Unglazed bottom provides better heat absorption. And in white, it matches most any serving ware. Microwave, oven and freezer safe. Holds 16 oz.